About a month ago, I experienced a profound shift back into myself, which reconnected me with my Original Medicine in a way that I hadn’t even realized was missing. I’ve been keeping quiet about this as I integrate and process, but I’m finally ready to share. This is the first of four installments in the story of Original Medicine that I will share with you during the month of July. As part of a mentorship weekend with my cohort, I had the pleasure of receiving a session of Equus work from Jesse Johnson. I had looked forward to this for the entire six months leading up to the weekend. I have always felt very connected with horses (both through riding them as a kid and working with them as part of my practice in recent years). In Equus work, the horses serve as the guides and mirrors of the person receiving the session. I knew that whatever energy and emotion I was feeling would be reflected in the behavior of the horses. 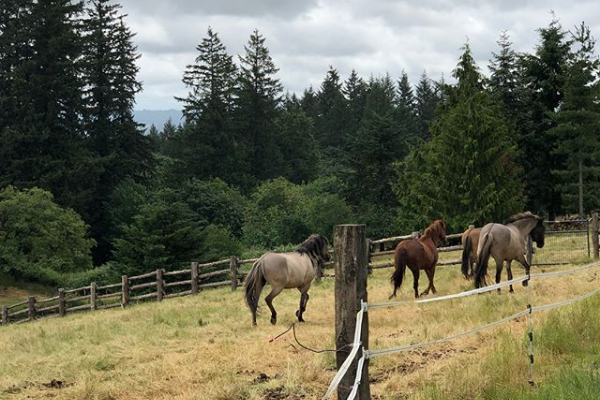 These horses in particular were all wild mustangs that had been rounded up by the BLM off federal land in Oregon. Their first contact with humanity had been incredibly traumatic (think helicopters and lassos), but they had since been rescued and gentled under the compassionate care of the ranch owner. I felt simultaneously honored to work with the horses, humbled by their powerful presence and reverent of their pure energy. Our exercise consisted of working directly with the horses in pairs. My partner and I elected to go first and were matched with a gorgeous black gelding named Kett. My intention for this practice was to simply enjoy myself, to embody and emit my heart light and to connect with my Original Medicine. Our goal was to silently/nonverbally communicate and connect with Kett and with each other. There was no particular agenda to this exercise, but to simply play with the dynamic. I immediately dropped into my heart space and felt resonant with Kett. I stood next to him and placed my hand on his withers, then issued a silent invitation and started walking. He paced next to me, turning as I turned, stopping and starting again as I walked. I felt completely present, joyful and aligned. After a minute or two, I felt my thoughts shift to my partner and my desire for her to have an experience with us. Instantly, Kett stopped walking beside me. I tried to gently encourage him to resume our engagement, and even tried to amplify the energy to elicit a bigger response, but he stood resolutely still. I attempted to shift my energy back into my heart but found myself wrapped in thoughts like, “I really want my partner to have the experience she wants,” and “I hope she doesn’t think I’m monopolizing the exercise.” At this point, my partner stepped forward and formed her own connection with Kett. He began to walk with her, just as he had with me. As I witnessed their interaction, I felt my energy return back into my heart and connected with my partner. I relished feeling her enjoyment of the experience. I then felt our collective three-way energy as both my partner and I connected with each other and with Kett. Together, my partner and I amplified our collective connection and made our energy bigger. Kett began to trot, then to canter around the arena as we silently urged him with our energy and intention. Since this experience from last month, I’ve been sitting with that question. How am I living in alignment with my Original Medicine? How am I bringing this into balance in all three realms of Self, Spirit and Earth? Are there areas where this is incongruent? You may recall that, a few weeks ago, I told you that I was remodeling my work and I asked you what you would like to see from me and my offerings. I have taken your feedback to heart and have made adjustments accordingly. This new direction feels far more aligned between Self (what I’m excited about and lit up by), Spirit (my authentic agreement with Source and my Original Medicine) and Earth (how I am offering and expressing this work, and what my community is asking of me). I will be sharing the result of this inquiry in two weeks (on July 18). There's so much possibility and opportunity that comes from Yes. Going on cool trips, receiving gifts, trying new things... there are so many great things that can come from Yes. But where does our YES start to feel like a burden? We receive a lot of training on the correctness of Yes. "It's rude to refuse." "This person said Yes to me, so I have to say Yes to them." "If I don't say Yes, I will look bad." Even in games and practices, we are encouraged to say Yes to keep the conversation dynamic flowing. A few years ago, I started embracing NO. I said No to invitations, offers, dates and gifts. I said No to people who didn't feel aligned with my values. I learned to love NO. Recently, I've been playing with my YES and NO even more, when it comes to my work. As I am shifting the focus of my offerings and my practice, it means that I am moving away from serving certain types of clients, for whom I still hold a great deal of love and compassion. These have been some of my most challenging NOs to date. As a healer, when someone comes to me in need, it pulls so fiercely at my heart. Yet, when I say YES to these clients, I feel the burden of turning away from my own, authentic service. I sat with this over the weekend during an intensive training. As I journaled about my business values and practices, one of the fears that arose was, "I cannot fulfill my most authentic service and still be available to the people who need help." I contemplated this belief from a place of compassion... for myself, and for those who reach out for a kind of support I am not prepared to deliver. I asked myself, "What is possible if I let this old story go?" The answer that flowed from my pen said, "It is possible that I can serve from a place of freedom, enoughness, trust, from knowing that I am still serving those who need me, trusting that I am working for change, and that those who are suffering will still receive from my work... that my practice holds the vibration of Joy and Freedom." In other words, I could offer my NO with love. I could offer a referral, or another type of help that would be more supportive for the person in need. I could hold my NO as a sacred ally to support me in my authentic service. ...and that is the only kind of YES I want to offer. I would love to invite you to join me at Camp Yes this summer! Imagine lying in a hammock under huge cedar trees and remembering what it is like to actually relax and be present. Imagine stepping away from all the noise to tune in to your inner voice and wisdom, while floating on a unicorn (I'm not kidding) down the river. This is a place to reconnect with yourself and your purpose through the power of Play! What would be possible if you said YES to yourself? To your heart's mission? I will be facilitating a playshop at Camp Yes about working with the magic of YES and NO! Come join me and a group of other amazing women as we say YES to ourselves and our most authentic way of being! As a member of my inner circle, you get a special insider offer. Use the code ALCHEMY for a $50 discount off your ticket price! Early Bird registration ends May 31! Register now to reserve your bunk. I am holding myself accountable. When I learned about the tragic death of the Hart family, I assumed it was an accident. I gave them the benefit of the doubt, thinking maybe the driver had fallen asleep at the wheel or had somehow lost control of the car. I knew of the Hart family largely through the periphery of my community. I spoke with Sarah once, chatted with Abigail and Hannah about their costumes and never again personally interacted with any of them. I fell for the carefully curated image they presented. I saw what I thought was a group of happy, healthy kiddos running around, freely connecting with community and sharing their love. I saw the photos when they popped up on my feed, and never thought twice that anything might be amiss. When I heard about the death of these children, I thought it must have been a horrible mistake. As more articles described the charges, the abuse and details of the scene, I felt taken aback that this tragedy was looking less and less like an accident. I am challenging myself to say anything about this topic at all, because I'm not directly involved, I barely knew the family and I generally dislike engaging with Facebook as a conversation platform (*note: I originally published most of this article as a Facebook post). ...but despite all of that, I was unknowingly complicit in condoning not only the terrible abuse of these children, but of white supremacy, white bias, and participating in the suppression of people of color. By not saying anything, I would be letting myself off the hook, in a way. But that's not how I roll. I'm hesitant to make this about me, because the world knows we don't need more of that, but that's really my best place to start. If I don't hold myself accountable, who will? If I don't challenge my own subconscious ideas and background narrative, who will? If I don't address my underlying beliefs about privilege and racial justice, who will? If I don't ask myself how I indirectly participated in the murder of six children who were members of my community, who will? Most of my work focuses on the micro: how can I support people as individuals? How can I help every human I meet to feel more empowered, healthy, aligned and present in their heart? I hesitated to share this article because this is a very macro-topic of social justice, but when I ask myself how I can show up and serve more fully, I can approach it from a micro- point of view. If you would like to join me, please see below for three invitations. We call upon and invoke the presence of our own Innocent Hearts, Archangels and Ascended Masters, guides and teachers of Hannah, Devonte, Abigail, Markis, Jeremiah and Sierra, to please be present for this highest of healings for them, for their highest and greatest good. Please support their process of transition. We ask that their karma may be cleared of all abuse, fear, trauma, pain and suffering incurred in this lifetime and in all their lifetimes. Please help them to integrate the lessons of their lives and their deaths, so they do not need to repeat this pattern again. We ask that they receive support in shifting their soul patterns to align with health, happiness, vitality, joy, expansion, ease and love. Please help them move through the veil with ease and grace, knowing that they are loved, supported, held, Divinely protected and guided. Please let them release all that which does not serve them, and receive exactly that which they need on every level--physical, mental, emotional, spiritual, throughout all dimensions and throughout all space and time--so that they may be completely whole and healed. Thank you, thank you, thank you for the blessings. We offer our deepest love to Hannah, Devonte, Abigail, Markis, Jeremiah and Sierra. We are so sorry for the traumas that you endured during this lifetime. Please forgive us. Thank you. We love you. We call upon and invoke the presence of our own Innocent Hearts, Archangels and Ascended Masters, guides and teachers of Jennifer and Sarah, to please be present for this highest of healings for them, for their highest and greatest good. Please support their process of transition. We ask that they receive the support that they need in order to move through the Realm of Suffering Souls. Please help them to align with forgiveness, compassion, grace and love. We ask that their karma may be cleared of all patterns of abuse, violence, trauma, pain and suffering incurred and perpetrated in this lifetime and in all their lifetimes. Please support them in integrating the lessons of their lives and their deaths, so that they do not need to repeat this pattern again. Please let them release all that which does not serve them, and receive exactly that which they need on every level--physical, mental, emotional, spiritual, throughout all dimensions and throughout all space and time--so that they may be completely whole and healed. Thank you, thank you, thank you for the blessings. It is only by asking ourselves the challenging questions that we can push our edges and grow. I firmly believe that system-level change begins with the individual--meaning that our personal patterns and belief systems directly translate to the patterns and systems present on the societal and global level. If we wish to change the system, we must look at the core beliefs of the people in the system: change happens from the bottom up, not the other way around. If we live in a society that condones white supremacy, white bias and child abuse, we must investigate each of our core, underlying beliefs. This is where it can get a bit challenging. Looking at something in ourselves that is surrounded by emotional charge, societal conditioning and so much tension and judgement can make anyone shy away. But if we never look at it, it will never change. So we must look at it. The good news is, you do not have to share your journal with anyone! (I do, but that's me. I have a higher threshold for personal discomfort than most people.) Your innermost thoughts and beliefs can stay on the page--that blank paper is your refuge. That being said, please take this as an opportunity to be honest with yourself. You might uncover something you don't like--some hidden belief or bias, something that maybe you wish you didn't know about yourself. This is the risk we run whenever we do personal work! And yet, it is also the reward. When we shine a light on our deepest shadows, it can feel profoundly uncomfortable. Please know that you are safe, it is okay for you to look at these parts of yourself and that overall, you will be more empowered as a result. What are my beliefs about my own racial identity? What does that say about me? How do I want to feel about my racial identity? What are my beliefs about other people of the same racial identity as me? What are my beliefs about people of other racial identities? How do I consciously AND subconsciously relate to people who are the same racial identity as me? How do I consciously AND subconsciously relate to people of other racial identities? How do I want to show up in the world in the context of my own racial identity? How do I want to relate to people of other racial identities? This is by no means a comprehensive guide. I absolutely do not claim to be an expert on racial justice. However, I am an expert on personal work and investigation, and this is the best I have to offer: a place to start. If you're interested in more, check out this resource that a friend sent my way: SHETalks WETalk: Race Talks for Women. What is the role of Innocence in the heart of the awakened Spiritual Warrior? However, I received some profound teachings regarding Innocence last weekend during a deep meditation ceremony. This gift has since radically shifted my ideas around the quality of Innocence. As I entered a deep meditative state, I began to receive images and information. At first, my guides showed me animals. I connected with (and in some cases, became) a whole array of different creatures, including cats, various kinds of fish, sloths, wolves, foxes, snakes, and so many birds. I noticed as I did so that one quality was ubiquitously present in all of these beings: they lived in Innocence, and in order to connect with them, I also had to be in a state of Innocence. I registered this as congruent with my lived experience of working with animals: in order to engage with animals and connect with them on the heart level and communicate with them psychically, I need to embody my Innocent Heart. I had never consciously recognized the particular flavor of this feeling, but upon further reflection, the energy is unmistakable: being in the presence of an animal (either in the physical or the psychic realm) immediately drops me into my own Innocence. Following this array of beautiful connections, my guides showed me a series of very dark entities. I saw an enormous, shadowy mask of a being that fed on fear, and I witnessed how these Fear-Feeders cover the Earth, ravenously consuming the energies of human stress, despair, anxiety, anger and loathing… but their favorite food is fear. I watched this giant shadowy shape with a feeling of detached curiosity. It aroused no terror in me and I felt no need to defend or protect myself. I knew that I was safe. As I regarded it, I noticed at its base the figure of an orange cat walking nonchalantly toward it. The Fear-Feeder had no effect on the cat. I released a gentle breath, and the Fear-Feeder disappeared. “Fear cannot live in the Innocent Heart.” I heard these very distinct words, and again, I was shown the Earth. This time I saw that the Fear-Feeders easily attached to some people, but not to others. Looking more closely, I noticed that these dark beings hungrily feasted upon the energy of those people who had lost their Innocence, but seemed somehow invisibly repelled by those whose protection came from their Innocent Hearts. Reflecting on this information post-ceremony, I find myself sitting with this question: What is the role of Innocence in the heart of the awakened Spiritual Warrior? As a self-identified Spiritual Warrior, I have long associated this archetype with the qualities of courage, resilience, compassion, grace and the ability to fight and be fierce, if need be. The Warrior of the Light must be willing to face the darkness and work in the Shadow realms, though their ultimate power lies in peace. Until now, I had never attributed the quality of Innocence to the embodiment of the Warrior archetype. However, after witnessing the Shadow entity have no effect upon the cat in its Innocence and arouse no fear in me as I embodied my own Innocent Heart after connecting with the animals, I realized that Innocence is the ultimate protective force. Instead of banishing the Fear-Feeder with an intention, surge of energy or by invoking my Spirit Guides, I exhaled a gentle breath from a state of Innocence and the Shadow being vanished immediately, without a trace or a struggle. In addition to acting as a protective energy, the quality of Innocence enables deep connection. In the Innocent Heart, there is no room for shame, guilt, blame or unworthiness. Instead, there resides love, compassion, grace, curiosity, acceptance, joy, authenticity, and plenty of spaciousness to invite shared experiences. Think about young children in their Innocence: they love easily, feel no sense of shame or judgement, and effortlessly invite others to join them in their space of enjoying the world. Is it possible to reclaim our Innocence once we have seen and experienced the darkness? I firmly believe that there is no experience so terrible that we cannot heal from it and release the wound completely. In light of the messages received during this meditation ceremony, this conviction now includes the belief that part of our journey is to reclaim our Innocence, not from a state of denying or forgetting the darkness, but from knowing that it is there and choosing not to be afraid. When we can accept that the darkness, shadow beings and Fear-Feeders are an ever-present part of the energetic balance of the cosmos, without succumbing to fear or despair, we shall be truly free and empowered. In this case, the Innocent Heart is not naïve, but makes a conscious choice to embody its original nature. It does not deny the existence of the shadow, or engage it in battle, or fear it—the Innocent Heart is simply immune. Its protection is its very existence. As I sit with this information and integrate the teachings, I invite you to join me! See below for a suggested meditation and journal prompts. Together, let’s explore our Innocent Hearts and find more ways that this quality of Innocence appears in our lives. The Innocent Heart chooses the path of love, and love liberates all beings. From one Innocent Heart to another, you’re doing great out there! Find a beautiful candle in a color and scent that is the most pleasing to you. Let it be something that you genuinely enjoy and appreciate. (Bonus points for a beautiful candle holder or dish.) Set the candle, along with flowers, crystals or any other items of your choice, on a sacred altar space. If you do not already have an established altar, please consider this an opportunity to create one! Make sure to journal about your experience! See below for additional journal prompts. Feel free to repeat this meditation and see what comes up as you continue to connect to and build a relationship with these teachers of Innocence. What is my relationship to the quality of Innocence? How can Innocence support me on my path? When do I feel most connected to my Innocent Heart? How can I more easily embody my Innocence and share it with others? Grab a journal and a pen. Don't overthink it, just write and see what comes out!